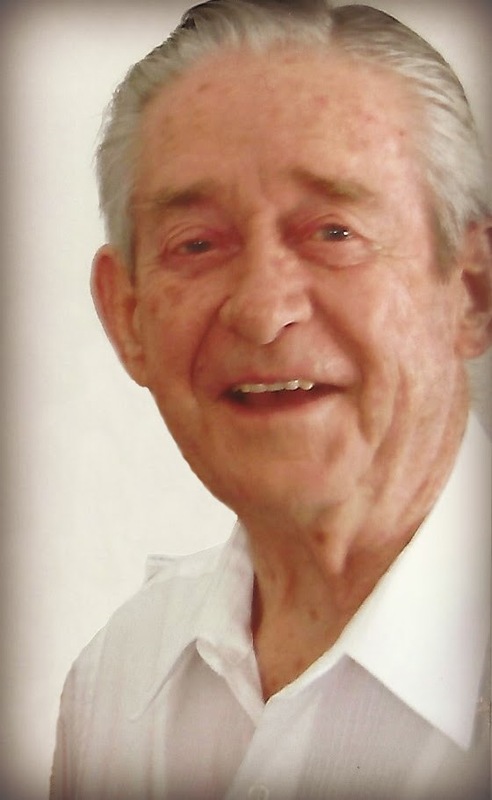 Raymond Nelson Larsen, 91, passed away May 26, 2018 at the Higley House Group Home in Gilbert, Arizona. Born on September 13, 1926 and raised in Brigham City, Utah, Raymond “Ray”was the youngest son of Merlin Russell Larsen and Judith Viola Nelson. He graduated from Box Elder High School in 1944, enlisted in the United States Navy that same year, and served in the Pacific Theater of Operations during WWII. Ray married the love of his life Kirma Snow, also of Brigham City, in the LDS Logan Temple on July 2, 1947. They are the parents of seven children: David (Marge) of Hinckley, Utah, Michael (Annette) of Oregon City, Oregon, Judy (Stewart) Adams of Mesa, Arizona, Karen (Jack) Huish of Taylorsville, Utah, Gail (Mark) Snow of Gilbert, Arizona, Barbara (Neal) Jones of Mesa, Arizona, and Alan (Alina) of Tucson, Arizona. Ray and Kirma lived in Brigham City and Salt Lake before moving to Garfield, Utah, a mining town owned by Kennecott Copper. Eventually the town shuttered its doors and Ray transplanted his family to Magna, Utah in 1956. Ray was employed at Kennecott Copper Corp. as an Industrial Relations Representative. While thus employed, and while providing for his family, he attended and graduated from the University of Utah in 1964. In 1968 he began work for Marathon Steel in Phoenix, Arizona and moved his family to Tempe followed by subsequent moves to Sahuarita and later Mesa, Arizona. Upheavals in the copper industry, and facing an uncertain future, Raymond started his own business, ‘Ray’s Roofing’ and he took great pride in his skills and his ability to provide for his family. Managing a ‘Motel 6’ in the Phoenix area provided an income in later years prior to retirement. Ray and Kirma have centered their entire lives around church service and family values and have been very blessed to acquire so many friends throughout their lives. Ray loved to teach the gospel of Jesus Christ and served in many leadership and teaching capacities. His and Kirma’s most difficult and challenging call came when they served an LDS mission to the West Indies. They worked tirelessly teaching the gospel, serving the poor, feeding the hungry, and learning how to live in a country of much poverty and hunger. Upon their return, they worked as temple and ordinance workers in their beloved Mesa Temple and performed much family genealogical work there. Raymond always possessed a strong sensitivity towards the place of his birth. He loved Brigham City! The history, the people, the peach orchards, the panoramic views, but especially the majestic and rugged mountains to the east of the city where he spent much of his childhood. Ray was an excellent carpenter and bricklayer and each of his homes reflected the benefits of his skills with room additions and modifications. In later years he enjoyed rebuilding old furniture and working in his shop. He also loved working in his orchard and many have benefitted from the fruits thereof. Raymond was preceded in death by his parents; several siblings; a grandson, Kelly; and by his wife and beloved companion, Kirma, who passed away almost one year ago on June 28, 2017. Besides his children, Ray is also survived by a sister, Barbara Baldauf, Taylorsville of Utah; sister-in-law, Roberta Larsen of Salt Lake City, Utah; brother-in-law, Hilton Mose of Houston, Texas; 25 grandchildren; and 48 great-grandchildren. Our heartfelt gratitude goes out to Ella and those caregivers at Higley House as well as to Dad’s Home Teaching companion and best friend, Marv Hollingsworth, who ministered right to the end. Thank you and God Bless. My husband, Bob, and I loved Ray and Kirma…we were together in the Mesa Alta Mesa ward and they were especially nice to us as my sweet husband was in his last days…I am so thankful they are together again……. (sorry I will be out of town on Saturday or I would be there). Families will be forever. Our family was one of the lucky recipients in Tempe of having Ray Larson and Marv Hollingsworth as their home teachers. They set the bar high and have been an example to me throughout my life. Many thanks to both of them for their service. As a twelve year old Ray would invite me over on Sunday afternoons to play chess with him after church and attempt to teach me the game. Sorry for your loss, but families are eternal and Ray lived that way his entire life. Unfortunately I will be out of town on Saturday so I will miss his funeral. Our thoughts are with you as you gather to celebrate the life of your dad and grandpa. We hope you are comforted with thought that he is with your sweet mom. I have been thinking about all of your family today. Uncle Raymond made the best fudge! I always enjoyed when our families got together and I actually had some cousins my age! Uncle Raymond and Aunt Kirma always made us feel welcome when we came to visit. They were solid in the gospel and in their love of family. My love goes out to all of you at this time of loss and change. My love to the Larsen family. I have so many wonderful memories of the time we were friends in Magna.